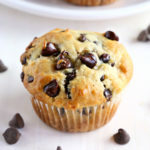 These Best Ever Greek Yogurt Chocolate Chip Muffins are the perfect low-fat sweet snack made with Greek yogurt! They're quick and easy to make, and they're perfectly moist and tender! Preheat your oven to 350 degrees Fahrenheit and line a 12-cup muffin tin with paper liners. Add the milk, Greek yogurt, vegetable oil, eggs and vanilla and stir everything together with a wooden spoon or a spatula. Gently stir in the chocolate chips once everything is combined, just until they're distributed evenly throughout. Portion the batter into the 12 muffin cups evenly and bake at 350 degrees Fahrenheit for 18-20 minutes, or until the muffins are cooked through (test with a toothpick!) and are a light golden brown colour on top. Let the muffins cool for several minutes and enjoy warm. These muffins keep in an airtight container for up to three days at room temperature. Reheat slightly before serving, if desired.